Basically any dress that looks like this or has this feel, flowy chiffony and a price tag less than $50 bucks each... I want it in a dark gray/charcoal... neckline can be different. My girls range is sizes from 0/2 to 14/16 ... i did think about altering the 10's down, but not sure if it will work. If anybody knows a way to do this - i'm open to suggestions. Thoughts, opionions? Suggestions... anything... i'm feeling desparate! Your dresses remind me of mine sort of...a flowy chiffon knee length dress with a pretty neckline :) Though my girls had to pay $140 for theirs :( If I had to do it over again, I wouldn't buy the BM dresses at a bridal salon but would have looked online or at stores like Macy's, Nordstrom's, etc. Nice find. If I see/think of anything, I'll let you know! ?? 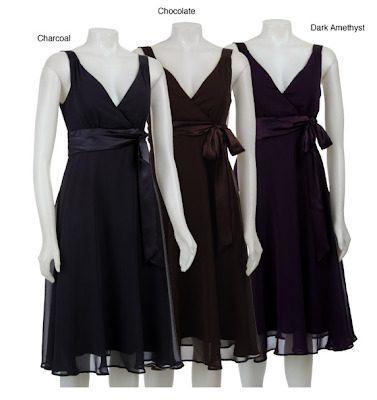 anyways...i think they are called sophia... chiffon...we used black...very simple..elegant! 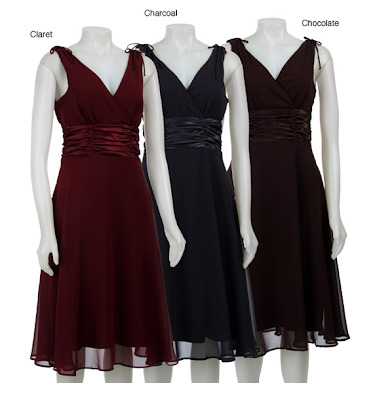 Please check these dresses out. I hope it helps!!! These dresses look great. Who are they made by? Hey Amy... not inthe price range...but I came across this cute dress at nordy's!